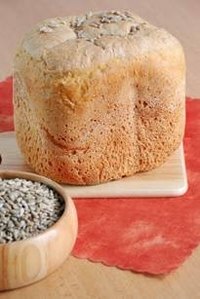 If you have a Breville bread maker, you will be able to make bread with an ease that is uncommon in the bread baking world. Breville has programmed so many options into the machine that you can use it to make your bread a work of art in flavors and ingredients. Here are the basic instructions to get you started. In no time at all, you will be smelling the exquisite aroma of fresh baked bread. Open the cover on the bread maker and remove the bread pan. There is a metal handle you use to pull it straight out. Insert the kneading blade, making sure it is straight on the shaft, inside the bread pan. Add the ingredients to the bread pan starting with the liquids. Pour in the fat, the sugar, the salt and the milk. Top it off with the yeast. Everything should be at room temperature. Place the bread pan back into the bread machine. Close the lid and plug in the machine. Hit the "On" button and the LCD screen should light up. Choose your settings by hitting the "Select" button. This is the basic bread recipe, so choose "Basic." Now choose the kind of crust you like. Select the 1250 ml size loaf for the recipe listed here. Hit the "Start" button. The machine will now go through its settings for the next 3 1/2 hours. Do not open the cover at any time during its operations. Remove the bread pan from the machine when it beeps three times and the "Keep Warm" light is on. Turn it upside down and make sure the kneading blade is still in the machine. Shake the bread from the pan and allow it to cool on a rack for at least 30 minutes. Press the "Stop" button and then unplug the bread machine from the wall. Allow it to cool down before you remove the kneading blade to wash it. Soak the blade and the bread pan in warm soapy water for about 15 minutes and wipe clean. Rinse and air dry.